This Toasted Spinach Pesto Ravioli post is sponsored by Pillsbury, but the content and opinions expressed here are my own. 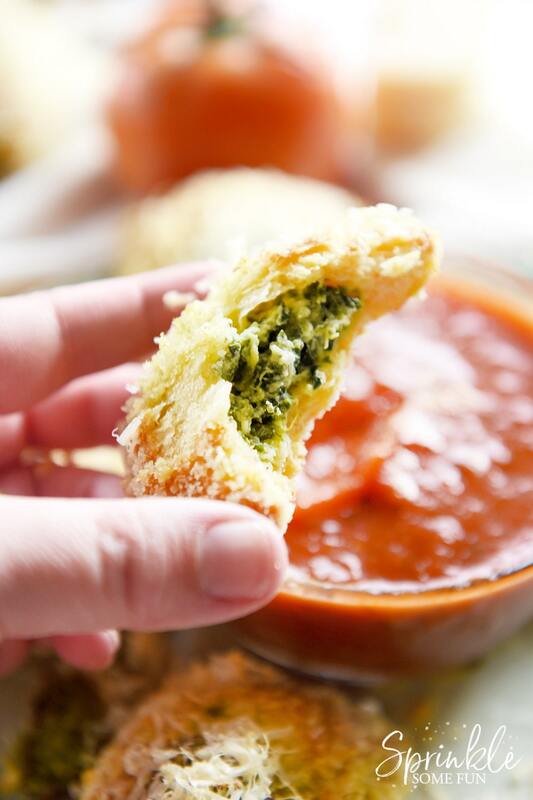 Pillsbury just had their 48th Pillsbury Bake-Off® Contest and one of the winning category recipes is Toasted Spinach Pesto Ravioli by JoAnne Tucker! Toasted Ravioli is not a dish I grew up with and I am not sure I even heard of it until I was a teenager. The first time I heard of it I was intrigued and knew I had to try it. We recently visited St. Louis Missouri and it was the first thing on my list for us to eat while were there. Of course it was amazing and I knew I wanted to try some recipes to make our own. 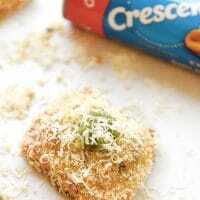 I love that this recipe for Toasted Spinach Pesto Ravioli is made with crescent rolls and baked instead of fried. The recipe came out amazing and my family loved the taste and crunchy texture! Just look at that spinach and pesto filled ravioli! So much flavor and the best part was that it only took a few ingredients to make. 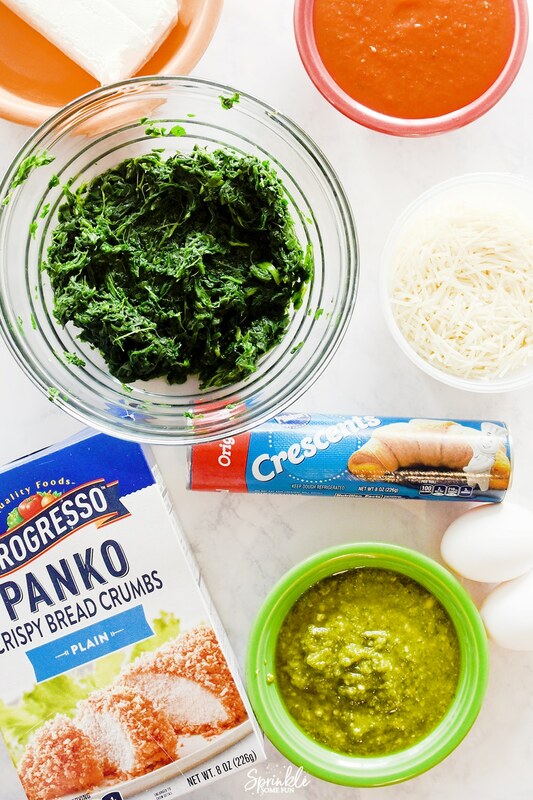 Using pre-made ingredients really cuts down the time to make this dish and I think using the Pillsbury crescent rolls as the dough is genius! 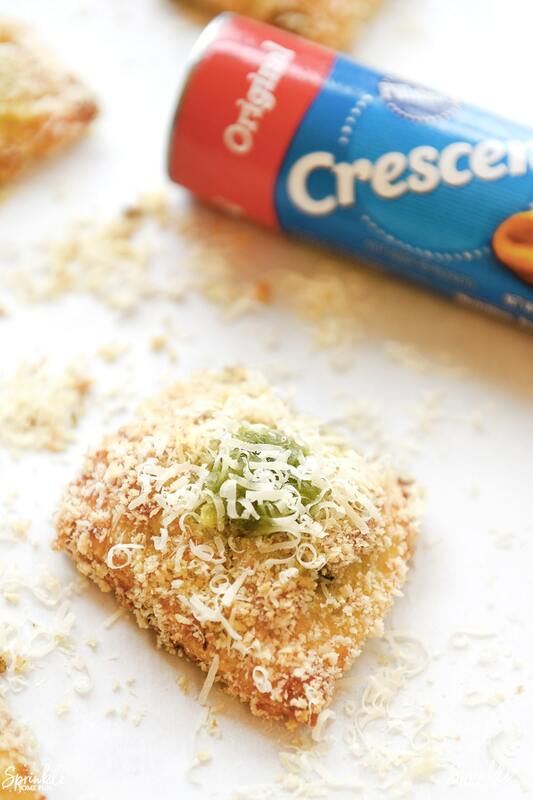 The ravioli become really crunchy because of the Progresso Panko bread crumbs. This dish would make a great appetizer for a party too. Just have a spoon for the marinara and everyone can grab a Toasted Spinach Pesto Ravioli and a little sauce on the side. I also liked serving it with the leftover pesto as well! 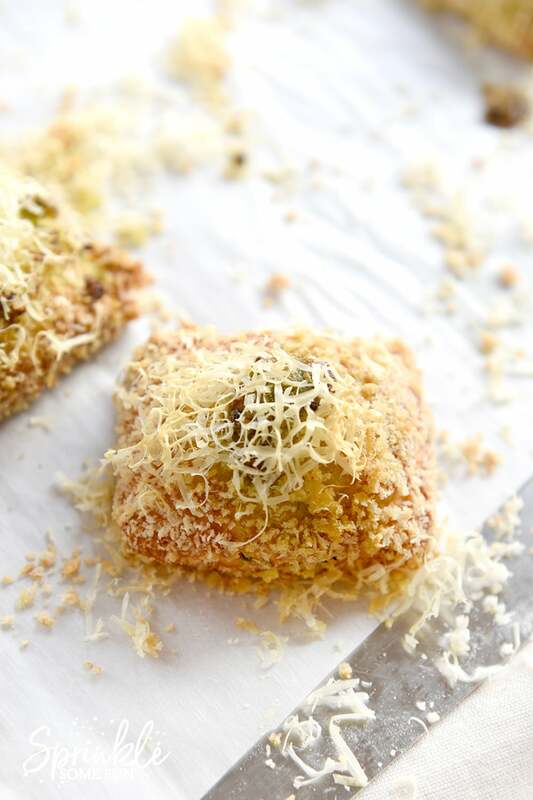 This recipe is definitely a must-try along with all the other category winners in the 48th Pillsbury Bake-Off® Contest! Heat oven to 375°F. Line 2 large cookie sheets with cooking parchment paper, or spray with cooking spray. Microwave spinach as directed on box. Drain well; squeeze dry with paper towels. Lightly sprinkle work surface with flour. Unroll dough on surface; if using crescent dinner rolls, pinch seams to seal. sheets. For easier handling, refrigerate 15 minutes. 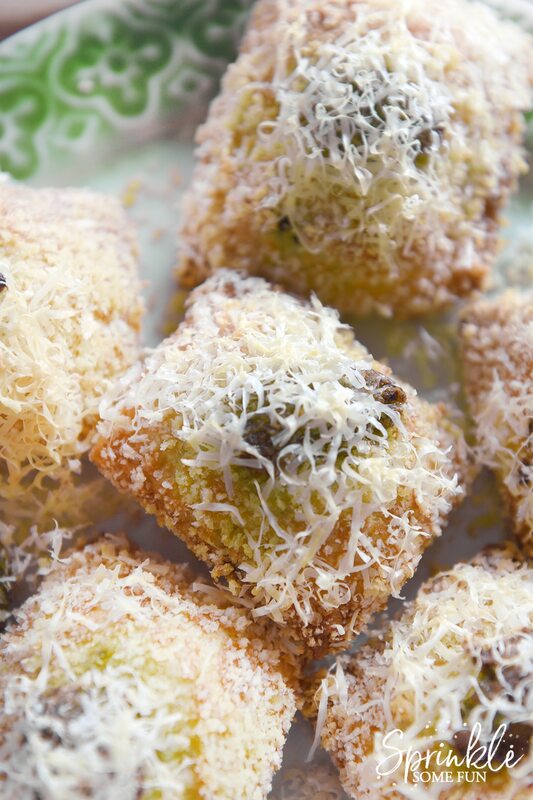 sprinkle with remaining 1/4 cup Parmesan cheese. Bake 16 to 18 minutes or until golden brown. 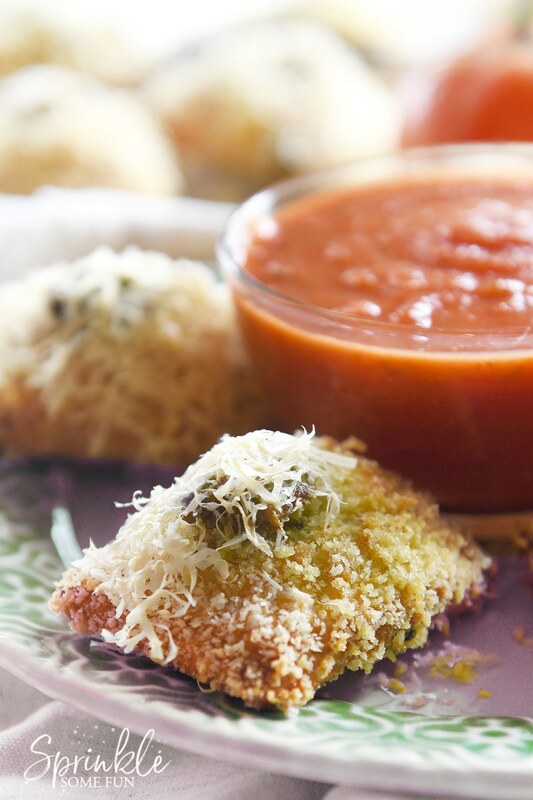 I’ve never found a recipe for toasted ravioli which I tried for the first time at one of the chain Italian food restaurants years ago. I have to admit, I haven’t tried to find a recipe for many years but this one does sound very good & fairly easy. Thanks for sharing it.